A crate is an invaluable tool in puppy-raising, both for management purposes and for training your puppy to do certain behaviors. Many of the solutions to problem behaviors such as potty accidents and chewing are dealt with more easily with the use of a crate. Your dog will spend less and less time in the crate as he gets older and when he no longer gets into trouble with naughty behaviors around the house. But even an adult dog should be used to being crated. You never know when you might need to confine your dog such as when he needs to go to the vet, or spend a few days in somebody else’s home, or when you intend to travel with him. The crate should be appropriately sized. 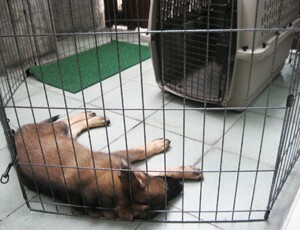 It should be large enough that the puppy can lie down at his full length, turn around, and sit and stand inside the crate without having to stoop too much. There should not be more space than necessary for the puppy to sleep in, so that he shouldn’t be able to potty to one side of the crate and sleep comfortably in the other. You may buy a crate sized for your puppy and then buy a larger one later on for his adult size. Or if you would rather buy a large adult-sized crate right away, you will have to reduce the accessible space within by filling it with a plastic box or container so that the puppy only has enough space for sleeping. 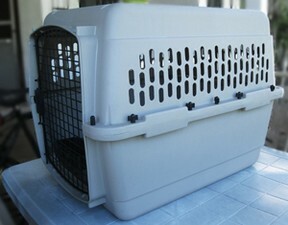 Most crate manufacturers provide sizing charts to help you determine what size is appropriate for your dog. Plastic and wire crates are available, but my personal preference is a plastic crate as it is lightweight and can easily be moved around. Be sure to take your time in properly introducing your puppy to the crate. Let him go in and out a few times before actually closing the crate door and confining him. Do not crate a puppy that has not first been given an opportunity to relieve himself. It’s also a good idea to leave a chew toy inside with your puppy so that he has something to occupy him while he is waiting to be let out. An exercise pen is useful for creating a play area or a long-term confinement area. This area is a good way to enforce time outs when your puppy gets too rambunctious or nippy. Exercise pens are generally made out of hard plastic or wire panels. When buying an exercise pen, test the assembly of the pen to see how well it stands up, and how easy it is to assemble or disassemble. Lighter pen materials such as plastic may be appropriate for small breed puppies. Heavier wire material should be used with large breed puppies, jumpers and chewers. Make sure your puppy’s pen is appropriately sized for his height and weight. 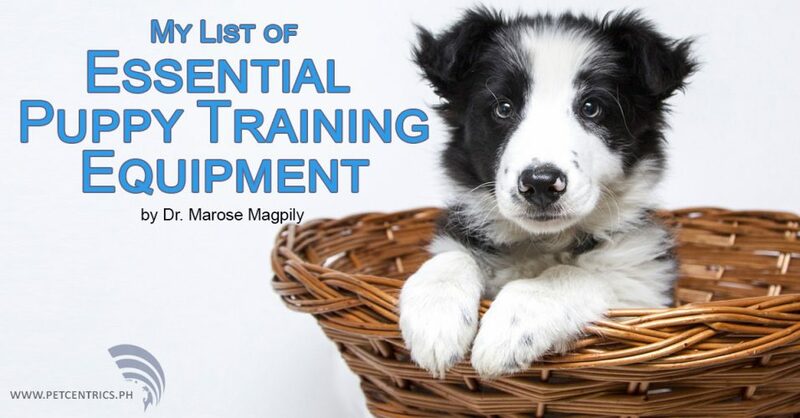 Most of the time, you will be supervising your puppy while in the pen, but for long-term confinement, you have to make sure your puppy can’t climb or jump out. Puppies have a natural desire to work their jaws and to explore things with their mouth. 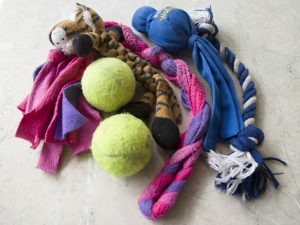 Therefore, you need to provide them with a variety of appropriate chew toys to satisfy this need. The best chew toys are made of incredibly durable, hard rubber. I personally prefer the Kong chew toys especially the ones that are hollow and that you can fill with dog food or treats that the puppy will excavate out of the toy. Whichever brand of chew toy you buy for your puppy, make sure it is of a good quality, will not be too easily destroyed and ingested, and that you buy one that is appropriately-sized for your pup. Manufacturers usually make sizing charts available to accompany their products. Supervise the puppy initially while you are still learning his chewing habits and when he is working on new chew toys. Tug is a great game to help you teach your puppy impulse control and some important rules about what is appropriate to bite and when play should begin. Tug toys should be tough enough that they don’t fall apart too easily, but also soft enough that your puppy will actually like sinking his teeth into it. The softness and texture may vary according to what your puppy prefers, and you may need to buy 2 or 3 different toys for him since having to play with only one toy can get boring really fast. Don’t get toys that can easily fall apart or that have parts that are glued on. Never leave a tug toy with a puppy because they are likely to destroy it and possibly swallow the parts. For simplicity, go with a simple flat collar on your puppy. 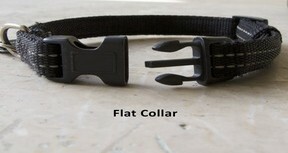 Flat collars do not tighten even when there is tension on the leash. Buy a collar that is just right for your puppy’s current size. To ensure that the collar is properly fitted, insert two fingers under the collar while the dog is wearing it. Your fingers should slide in snug without there being space between the neck and collar. A loose collar can be just as dangerous as an overly tight one. If your collar is too loose your puppy will likely slip out of it or catch the collar in his mouth which may cause him to panic, and which may result in your puppy getting injured. 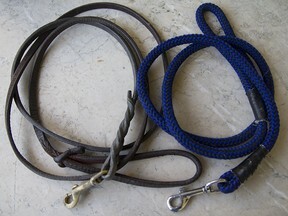 Leashes attached to loose collars can also cause the attachment ring and leash clip to slide down under the dog’s neck causing any length of leash to hang close to the floor and trip up a dog’s legs. For walks, for outdoor training and even for a few indoor training exercises, you will need to have your puppy on leash. Even dogs that are reliable off leash should be kept on leash in observance of proper dog owner etiquette, and leash laws or regulations that apply in your area. The leash should be at least 4-6 feet in length and not too heavy. I prefer leashes that are no more than half an inch to ¾ of an inch in thickness so that the dog does not feel the weight. You don’t need a heavy leash even for big dogs especially if you invest time in teaching a proper loose leash walk at a young age. DO NOT buy a retractable leash for your puppy. They are useless for teaching good leash manners and can be dangerous and harmful to your dog. I would only trust the most responsible and knowledgeable of dog owners, and those with dogs that are adequately trained, to use retractable leashes. 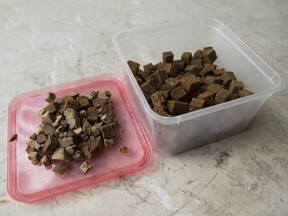 Food is a basic necessity for all dogs and can be used as a motivator for training. Your puppy’s food and a variety of treats should be used as rewards, and should take into consideration your own puppy’s preferences in taste, and any health issues such as allergies that require special diets. Ready-made commercial dog food and treats can be bought at pet stores for your convenience, but take note of the ingredients and make sure they are healthy and safe for your pet to consume. My personal preference is to prepare food and treats for my dogs myself and at home. Consult with your vet regarding appropriate puppy nutrition. As you get to know your puppy, you’ll be able to identify his preferences and be able to rank food and treats from being low in value to high in value for your puppy. Some puppies will not be very discriminating in taste and will accept anything you give them as being high in value. Other puppies are much more picky and will look for certain flavors, scents or even specific textures in your food. With such puppies, you will need to thoroughly experiment to find out what they like and what they don’t like. Stainless steel bowls for water and for feeding are recommended. The food bowl can be replaced with stuffed Kongs so as to slow down your puppy’s eating and to stimulate him mentally as well as physically during feeding time. Dog beds can be used in place of crates to restrict the dog to one spot within the house. This behavior can be useful if you need your dog out of the way for some time, such as when visitors are over or when you are busy cleaning the house floors. Unlike crating the dog, sending the dog to his place on the bed is not as restrictive and the dog is still allowed to see the goings-on. Going to the bed and staying on it are, of course, trained behaviors that need to be taught and practiced before they can be useful in real-life scenarios. It is the responsibility of every dog owner to clean up after their own dog. Therefore, poop bags are essential to carry around with you at all times that your puppy is with you outdoors. A scooper helps to pick up poop, but a classic method for picking up poop without a scooper is to turn the plastic bag inside out, wear it like a glove, pick up the poop with your plastic-gloved hand, then turn the plastic over so that the poop ends up on the inside of the bag. Dispose of the poop-filled bag in the appropriate garbage bin. Remember to thoroughly wash your hands with soap and water, or disinfect with alcohol after scooping poop. At home, cleaning soiled areas with regular household cleaners may not be enough to break down the scent particles that attract a dog to the same spot when he needs to relieve himself again. An enzymatic cleaner, however, should do the job. Dog feces and urine can be carriers of certain human diseases, so its important that you follow up with a good disinfectant after cleaning areas that your puppy may have soiled. Naturally, cleaning after your puppy will require certain tools. Prepare these beforehand so you can quickly clean up any messes before your puppy or other people living in the home accidentally step in them. Dogs should be bathed once or twice a week using a good dog soap or shampoo. Use only warm water when bathing your puppy and towel dry or blow dry him immediately after. A variety of dog soaps and shampoos are available at pet stores but you should check if the ingredients are safe for your pet. Special grooming equipment such as brushes or combs will be necessary depending on the kind of coat that your dog has. You may also purchase a pair of dog nail clippers to keep your dog’s nails trimmed. All dogs can benefit from being conditioned to wearing a muzzle, whether or not they are aggressive to begin with. A muzzle can be used in emergency situations, such as when you need to restrain the dog when he is injured. Even the nicest dogs may bite when in extreme pain. If the dog is already used to the muzzle, then you there will be less of a struggle of putting the equipment on should the need arise.